About Sulyma Productions – Sulyma Productions Inc.
A leading, independent arts and entertainment producer, Michael Sulyma began his company while exploring the realm of television and film production, starting with his work at the National Screen Institute of Canada. Combining his arts background with his degree in business and years of experience with the accounting firm Coopers & Lybrand, Michael became a busy production manager, producing numerous projects for Stage West, television and London’s West End. Michael has also produced 24 years of international tours of The Kyiv Ballet of the National Opera of Ukraine, Canada’s Ukrainian Shumka Dancers and the Chinese production of Chun Yi, The Legend of Kung Fu. In 2005, Michael Sulyma became Co-Producer with Beijing’s China Heaven Creation of a new Chinese multi-discipline production, Chun Yi: The Legend of Kung Fu a unique integration of modern dance, ballet and Buddhist Kung Fu. Chun Yi made its first six-month/150 performance showcase tour in North America followed by tours to Russia, Japan, Spain and India. Chun Yi had its West End premiere in London with a summer run in 2009 at The London Coliseum. Chun Yi continues its open-ended run both in Beijing and America, exceeding over 5000 performances to date. Currently it is the longest running theatrical production in China. Michael has produced eleven national and international tours for Canada’s Ukrainian Shumka Dancers. Most recently, Sulyma Productions Inc. (SPI) toured their 50th anniversary production of Shumka at 50 to 14 cities / 23 shows in China and 10 cities / 13 shows in Canada. 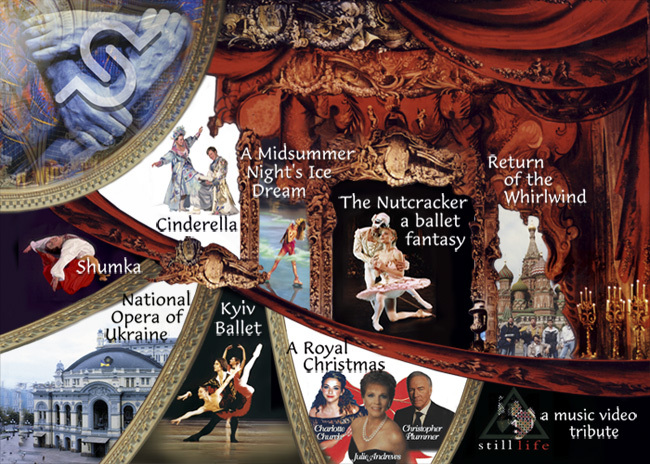 Artists of the Kyiv Ballet and Shumka joined forces for SPI’s THE NUTCRACKER, a ballet fantasy (which toured more than 100 performances over three years) and Snow White and the Seven Gnomes of Christmas. Excerpts of The Nutcracker were produced for the seasonal touring spectacular, A Royal Christmas starring Julie Andrews, Christopher Plummer, Andrea Bocelli, The Royal Philharmonic Orchestra and principal dancers from Royal Ballet Covent Garden, Bolshoi Ballet and the Royal Winnipeg Ballet. In additions to many movies of the week and television series, SPI’s television documentary, Shumka – Return of the Whirlwind captured Shumka’s monumental 1990 tour to Ukraine and Moscow, winning numerous accolades and awards, including a National Television Gemini Award nomination. He subsequently produced Shumka’s Katrusia, Cycles of the Sun, and Night of Perun for CBC Television. SPI’s films have been seen in over 37 countries. SPI’s current Canada-Ukraine collaboration is The Ukrainian Nutcracker, a full-length presentation of the beloved E.T.A. Hoffman story. “This unique and groundbreaking production brings an entirely new concept to the world of Ukrainian dance, as well as dance in general,” says Michael Sulyma, Sulyma Productions Inc. “The world of Nutcracker productions varies from classical ballet, to all male casts, to Jazz, Klezmer and Chinese dance and musical styles. This Ukrainian folk ballet representation of Tchaikovsky’s Nutcracker unites three world famous Ukrainian dance companies: Virsky, Ukraine’s State Folk Dance Company, Canada’s Shumka Dancers and The Kyiv Ballet. This is the first time The Nutcracker story will be created in the Ukrainian folk ballet style.” It will also be the first time in their 74 year history, that the Virsky company performs outside of their own repertoire.